One of the attic kneewall finds was a box that probably came from my Aunt Leila and Uncle Don’s house. 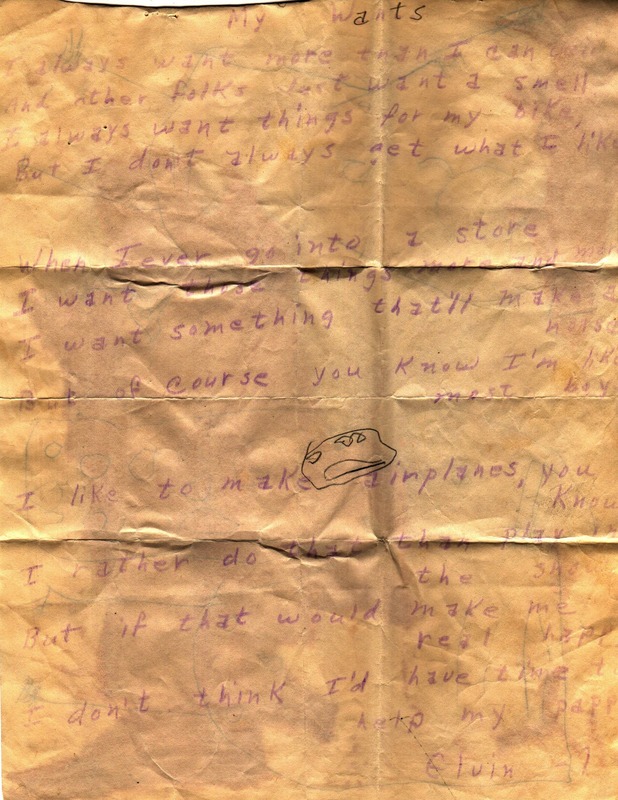 In that box, in an envelope marked Portrait Reorder Division was, among other things, a piece of paper with “To Elvin” written on one side and the following poem written in nearly completely faded purple ink on the other side. At first I thought it was simply an old mimeographed copy of something and nearly threw it away, but when I took a closer look I saw that it was a handwritten poem, signed by Elvin — my dad. And other folks just want a smell. But I don’t always get what I like. I want those things more and more. But of course you know I’m like most boys. I rather do that than play in the snow. I don’t think I’d have time to help my pappy. Here is the actual poem with the contrast turned up a bit so some of the writing is legible. Oh Dona how precious. Never knew we both had fathers who could write poetry. If it was me, I would frame this poem that your dad wrote. So special!!!! I wish it were more clear, Aunt Ginny. It is far too faded to frame.